This complete set with visible and discreet aluminum hardware ensures easy installation of a wooden door and add style to your room while gaining space. The Bent Strap Barn Door system features a classic face mount flat strap to hang wood doors on a traditional rail track. The large wheels provide excellent strength and durability as-well-as smoothness of travel along the track. The Straight Strap Barn Door system features a classic face mount flat strap to hang wood doors on a traditional rail track. The large wheels provide excellent strength and durability as-well-as smoothness of travel along the track. Exclusive to Colonial Elegance, the nature-inspired BOREAL is sure to turn heads and add a splash of panache to any industrial or rustic dicor. Flat rail dimensions: 78-3/4" L x 1/4" W x 1-9/16". Steel with a durable black powder coated finish for interior applications. Door track kit for openings up to 36. Accommodates a single door up to 1-3/8 thick. Weight capacity per kit: 300 lbs. Premium ultra-quiet rollers. 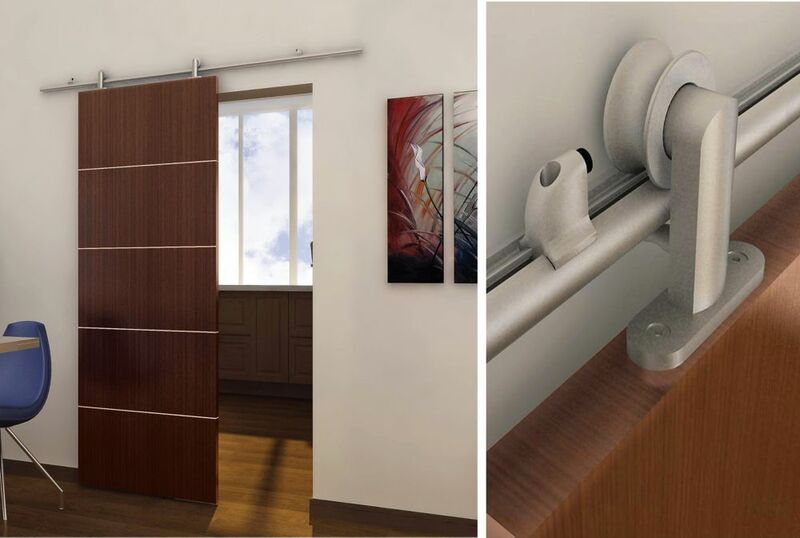 Urban Style Visible Rail System For Decorative Barn Doors This complete set with visible and discreet aluminum hardware ensures easy installation of a wooden door and add style to your room while gaining space. Urban Style Visible Rail System For Decorative Barn Doors is rated 5.0 out of 5 by 2. Rated 5 out of 5 by Lyfsa Beech from Well constructed with a nice finish Totally pleased with this rail system. It is well built, easy to assemble/install, looks great and functions well! Hello, thank you for your question. This rail should be screwed in studs. If you want to mount it to drywall so you have to use anchors. I hope this helps.Best regards. Customer care team. what is the door size only? The door in the photo is not included. However, the door you provide can be between 24-40 in. Is it possible to buy an additional set of hangers? I want to install 2 x 16&quot; doors.